The Culture Engine shows leaders how to create a high performing, values-aligned culture through the creation of an organizational constitution. With practical step-by-step guidance, readers learn how to define their organization’s culture, delineate the behaviors that contribute to greater performance and engagement, and guide behavior towards a safe, inspiring workplace. ...that happens in an organization day to day, including focus, priorities, and the treatment of employees and customers. Great culture drives great performance, and can help attract and retain talent. ... - it comes down from the top, inspired by the leadership. For an organization to fulfill its potential, the culture must truly reflect the heart of the company from leaders to team members. The Culture Engine helps leaders define the playing field, pushing performance to the next level. The book is one of Motto‘s 2015 “6 Best Branding Books for Entrepreneurs“! I know few people better qualified to help leaders create high performing, values-aligned cultures. In this book Chris explains what constitutes a culture that drives results and what it takes to make that culture come alive. Chris Edmonds’ approach will boost your team’s spirit, trust, and performance. WD-40 Company’s tribe culture was built upon these same concepts. Don’t hesitate – get this book and create your organization’s constitution. Where has this book been? The Culture Engine demystifies the what and how of driving your company’s culture to produce transformational business outcomes. Chris Edmonds operationalizes culture while offering practical tools necessary to align your people and gain profound competitive advantage. Finally a book about culture that answers the how. Everyone knows culture is important but most don’t know how to change their culture. Edmonds creates a detailed road map to help any leader deliver an inspiring culture that generates lasting organizational success. You will be hooked from chapter one. The Culture Engine is must-read for leaders of the future. This book is a concrete road map to creating and managing a productive and inspiring culture for your organization. The idea of developing an organizational constitution is brilliant. Who doesn’t want to work in an environment where the employees feel trusted, valued, and respected with a sense of purpose? This book will show you how to design such an environment. I highly recommend it. Organizational culture and performance are intricately interwoven. In his excellent book, The Culture Engine, Chris Edmonds shows how to create and use an organizational constitution – a break-through tool to help you shape this elusive, yet critically important ingredient to organizational success. Chris Edmonds has spent his career helping organizational leaders clarify, communicate, and align actions around shared values. In this book, Chris reveals his tools of the trade. This practical, experience-based, easy-to-use guide enables you to build an inspiring organizational culture with confidence and determination. 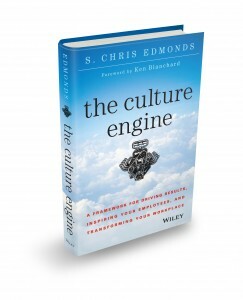 In The Culture Engine, Chris Edmonds clearly and plainly spells out how to shift your focus from chasing markets to building a strong, flexible organizational culture. You can also find it at 800-CEO-Read (discounts for bulk orders) Barnes & Noble, and Books-A-Million. Prefer an audiobook of The Culture Engine? Audible.com has it. To request an interview with S. Chris Edmonds regarding his most recent offerings including his Amazon best selling book, The Culture Engine, please contact Janet Shapiro with Smith Publicity.